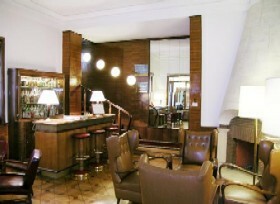 The Hotel Atlantico in Rome has held on to its 1930's Art Deco design which includes floors in precious woods and marble. Built on 5 floors, its 69 rooms are all tastefully decorated and include the most modern comforts to help make your stay in Rome an unforgettable one. Hotel Atlantico is connected to Hotel Mediterraneo (another member of the Bettoja Hotels Group) through an internal stairway from the lobby.A few steps from Termini Train Station, the Bettoja Atlantico is a hotel built in 1912 on the highest of Rome's 7 hills. It offers free Wi-Fi throughout, and breathtaking views of Rome from its rooftop terrace.Within 20 minutes' walk, guests of the Bettoja Hotel Atlantico can reach the Coliseum, Trevi Fountain and other major monuments. The Vatican Museums and Spanish Steps can be easily reached by metro. 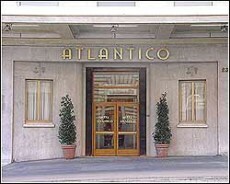 The HOTEL ATLANTICO is a Tourist hotel. 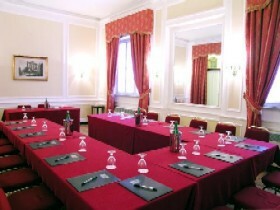 Located in City Centre - Termini area. Shopping is accessible by bus/taxi and the nightlife/restaurants are easily accessible by taxi or bus from the hotel. Descriptionclass="small" style="text-align: justify; font-size:11px;">The Hotel Atlantico in Rome has held on to its 1930's Art Deco design which includes floors in precious woods and marble. Built on 5 floors, its 69 rooms are all tastefully decorated and include the most modern comforts to help make your stay in Rome an unforgettable one. Hotel Atlantico is connected to Hotel Mediterraneo (another member of the Bettoja Hotels Group) through an internal stairway from the lobby.A few steps from Termini Train Station, the Bettoja Atlantico is a hotel built in 1912 on the highest of Rome's 7 hills. It offers free Wi-Fi throughout, and breathtaking views of Rome from its rooftop terrace.Within 20 minutes' walk, guests of the Bettoja Hotel Atlantico can reach the Coliseum, Trevi Fountain and other major monuments. The Vatican Museums and Spanish Steps can be easily reached by metro. Nice and clean room. New bathroom with a pleasant shower. Roof top pool with solarium and beach view. Sauna and relax area are available close to the pool ask for the wellness kit at the reception. Private beach 1 min from the hotel. Stayed here for 5 nights Aug 2017. From booking to departing was an excellent, friendly and enjoyable experience. Location is perfect with the beach at one end and the via Bafile at the other with its multitude of shops, bars, restaurants, Gelateria plus more. The beach was excellent with allocated sun beds and parasol so you never went without. 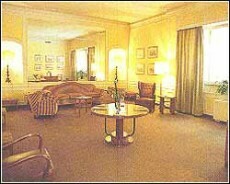 The hotel itself was well maintained and clean. The staff were very friendly and helpful even though they were not used to seeing many English people and some did not know the language very well. The room was spacious with two balconys overlooking the sea and pool. The beds were ok although the pillows were a little hard. Bathrooms with showers were good. The decor was a little basic but you only sleep and dress in there. The pool was one of the cleanest I've seen although a tad cold when you got in. It had plenty of sun beds and parasols. There was as small separate kids pool which was good. We stopped half board and the breakfast was good with a multitude of choices. At breakfast you had to chose the two courses from a list of five or six in each section, a pasta course and a main. The evening meal was the only disappointment as the two main courses were limited for the vegetarian we had in our party and the portions were small. There were plenty of buffet style starters and deserts but the quality was only average. Excellent wine list though. Also if you didn't stop full board there was little choice for lunchtime snacks. If it hadn't been for the food I would have given 5 stars and would definitely return again but choose B&B next time unless the food improved. Don't let the wee guy park your car for you! We did and he hit the car door against a wall. It wasn't his car so why should he worry about carelessly exiting from a brand new car. Talking to another couple, seemingly, he hit their car door off another parked vehicle. they could change the bed, not good enough for a 4 star, also general cleaning was poor. The dining room staff were all very good but they have an absolute star in a waitress who was there breakfast, lunch and dinner. Her name is JULIANA and she always has a smile on her face to go with her excellent service. 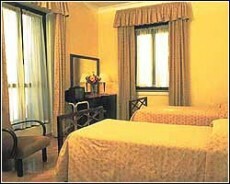 I would stay at Atlantico again on the same front facing , corner room. Two things stick our minds (my wife and I). Firstly, the tranquil adults-only spa and pool, on the hotel roof, which had great views, along the coast, in both directions. The single lift to the roof was a bit unreliable, when wanting to get down! There is little high-rise building along the sea-front. Secondly, the friendliness, politeness and helpfulness of every one of the staff that we met, were served by or happened across. Built between the beach (20 yards/metres away, from the hotel's drinks' lounge) and a couple of hundred yards to the main road (a misnomer, really, as it is one-way traffic - unless you count the bicycles, which have their own lane - and a low speed limit). The main road houses shops (touristy to high fashion, and many in between), restaurants, bars, lots of ice-cream parlours and the odd supermarket. Our room was very comfortable, with a sea view, although we didn't ask for one, and the bathroom was luxurious. The bedroom was a little short of cupboard space but maybe we take too many clothes away! The double-glazing made it extremely quiet, albeit that we were close the beach, and the electric metal shutter kept out all unwanted light. Both the seating area immediately outside the front of the hotel, which faces away from the sea/beach and is off a small side road/path, and the lounge (outside the dining room, and facing the sea/beach) are very pleasant places to enjoy a drink, either in the day or late at night. We ate out at night but breakfast could be as simple or as filling as any individual requires. Whilst breakfast didn't miss out on anything that we needed - they really offer a wide range of foods - we felt that some of the dishes could have been varied, from day to day, as there was never a change in the fare offered. Its position is fine, for most things, but banks/cash-points/ATM's are a problem, since the nearest are a 10 minute walk (at least) in either direction. If you want to eat out, either lunchtime or in the evening, there are a wealth of restaurants, cafes and bars. Stayed here for 3 nights while doing a tour of Italy. The hotel was lovely. Nice and clean with good size rooms. We had a sea view. The balconys are not very big but enough room for 2 of us to sit on on the evening to enjoy the view. As we were early our room was not quite ready so we sat on the terrace at the bar and ordered a coffee and we were given some delicious home made cakes to eat while we waited. A nice gesture. As soon as our room was ready the staff came to look for us to let us know. Very helpful staff if you had any questions. We were given a free lift back to the bus station on our departure without asking for it. The hotel allocates your sun beds for the beach with a beach pass and your bed numbers written on which is an excellent idea as you know where you are going every day, although you can change the location if you want to. The beach is kept spotlessly clean being raked every morning. You can walk for miles along the beach front it goes on and on and the same for the Main Street in the town. The town is a few minuites walk and is a very busy place. Too many resteraunts to choose from. If you want a a beach holiday near Venice then this would be perfect.